We're already a few months into Exclaim! 's 25th Anniversary, but there's still a lot more celebrating to be done. Hot off the heels of our Class of 2017 concert series, Exclaim! 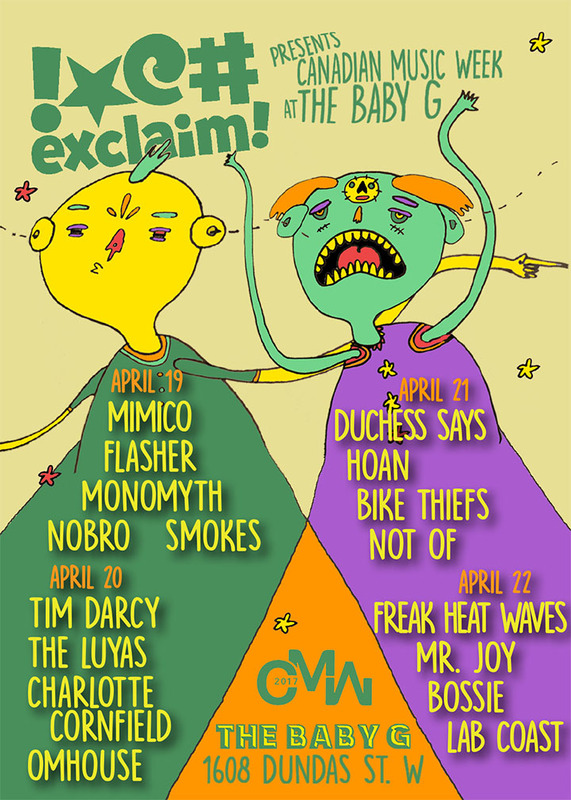 is pleased to present four consecutive nights of Canadian Music Week showcases at one of Toronto's newest venues, the Baby G.
The festivities begin on April 19, headlined by a one-two punch of post-punks with Washington, DC's Flasher (featuring members of Priests) and Toronto's Mimico. Halifax slack rockers Monomyth offer a chill reprieve while Montreal garage rockers Smokes and NOBRO keep things fuzzy. Ought frontman Tim Darcy will headline on April 20, bringing tunes from his debut solo LP, Saturday Night, to life. He'll be joined by Montreal indie popsters the Luyas, Toronto folkie (and frequent collaborator) Charlotte Cornfield and experimental electronic outfit Omhouse. April 21 marks a collision of two worlds: Montreal's Duchess Says and Hoan will keep things slick and shiny, while Ontario will be represented by a pair of distortion-heavy riff-rockers in Mississauga's Bike Thiefs and Toronto's Not Of. The final night, April 22, will bring together acts from across geographical and musical maps: Victoria post-punks Freak Heat Waves, Toronto electro oddballs Mr. Joy and Bossie and Calgary pop-rock crew Lab Coast. Don't forget to check out the Facebook events for the latest updates, and see the schedule below. Canadian Music Week will take place between April 18 and 23 at venues across Toronto. Full festival details can be found at the official CMW website.